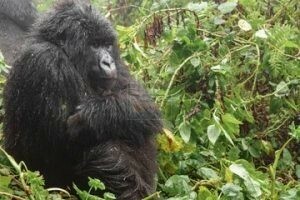 The 5 Days Combined Rwanda Uganda Gorilla Trekking Safari Tour, 5 Days Combined Rwanda Uganda Gorilla Trekking Safari Tour, Uganda Gorilla Safari is a short-combined tour featuring gorilla trekking in Uganda and Rwanda. The safari commences and ends in Kigali Rwanda taking you to Volcanoes National Park – the main destination for gorilla trekking in Rwanda, the Musaze Caves – historical caves of Rwanda that date back to over 65 million year ago, Lake Bunyonyi for a recreational and relaxation experience, Bwindi Impenetrable National Park for another adventurous hike to explore the critically endangered mountain gorillas not forgetting Kigali / Gisozi genocide memorial exploring the Rwanda’s horrific past. 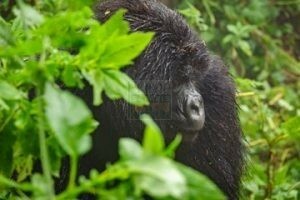 You depart your place of stay in Kigali Rwanda to embark on the drive to Volcanoes National Park 116km about 3 hours’ drive. The journey offers you magical views of the scenic Rwandan countryside including the rolling hills that have inspired its naming as the land of a thousand hills. Settle for lunch in Musaze after which you embark on the Musaze Caves exploration. The Musaze Caves are among the historical caves of Rwanda whose formation dates back to 65 million years out of the lava flow from Bisoke and Sabyinyo Volcanoes. The walk allows you to explore the 2km caves which have 31 entrances with a magical roof top full of bat colony. The Musaze Caves are noted to have been helpful in the turbulent times as they provided storage for supplies and hiding place. Retire for relaxation and overnight. Following breakfast at your lodge, you embark on the drive to Kigali passing via the Katuna border post. The drive offers you impressive sights of the countryside landscapes and upon arrival in Kigali, you embark on the tour of the Gisozi genocide memorial to learn about the horrific genocide that befell Rwanda in 1994. The Genocide Museum is well designed and organised to provide a detailed encounter of the causes and effects of the genocide horror.